bring those old bones with you! On September 9th, we will be having our alumni game. Anyone who wants to put on their boots and have some fun, all are welcome. The alumni game will be held at the football field at start approximately at 7pm. We will be holding our popular BBQ day at one of our home games. We are still working on a firm date. Please check out our schedule page to see dates and times of our home games. Same thing here. We are still working out the best date to hold our annual T-SHIRT day. Please check back here regularly. 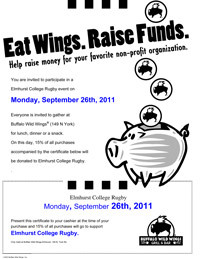 Buffalo Wild Wings fundraiser will be Monday Sept 26th. 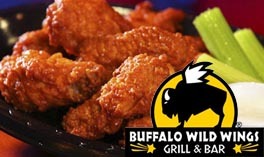 Enjoy some food and have a good time while watching some games at B-Dubs. Make sure you hand in the flier so our club will receive 15% of your purchase. be sure to bring the flyer!!! Print out the PDF flier below or look for them around campus or at our games. Our club won't get credit unless you submit a flier.